The Xhosa people are of the Nguni group, in the southernmost part of Africa. There are approximately nine million Xhosa, second only in size to the Zulu nation. The Xhosa people consist of several tribes such as the Mpondos, Mpondomise, Bhaca, Xesibe, Bomvana, Thembu, and the Xhosa proper. But because they all speak the common language of isiXhosa they are united by being identified as the Xhosa tribe. Six million AmaXhosa (Xhosa people) live in the Transkei, under the rule of the paramount chief and the regional chiefs, who themselves relate to the country’s governmental bodies. The tribe is governed by chieftaincies or tribal authorities. Even though the Xhosa homeland is the Transkei, they have been scattered beyond these borders as a consequence of a national disaster that occurred in the mid-1850s. This is what is known as Nongqause, after a young Xhosa girl of that name. Nongqause was regarded as a amagqirha (prophetess). She had a vision in 1856 of the warriors of old. Their message was to tell her people, who were the original Xhosa tribe, that they must destroy all their cattle and crops, and thereafter, fatter herds and better crops would arise from the earth to replenish the losses. The warriors then said, through Nongqause, that they themselves would arise and help drive the white men back to the sea. The prophecy wasn’t fulfilled and as a result, tens of thousands of the Xhosa died; others fled south across the Great Kei River to the white owned farms in South Africa to beg for shelter and food. 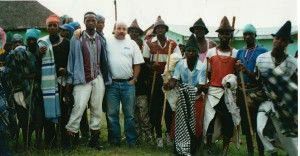 In spite of this great dispersion the Xhosa returned to their homeland of the Transkei and respect their tribal structure and their traditional culture. They still have their mystical little water spirits called the Tikoloshe, along with their witchdoctors, and their ‘lightning bird’. 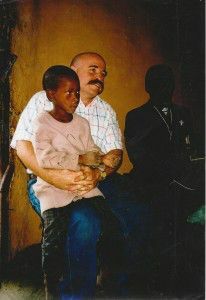 They still maintain their tribal dress and cultural customs. The Xhosa basic spiritual belief is the worship of the spirits of their dead ancestors, whom they fear. Their worship includes the slaughtering of animals and having feasts in honor of their dead ancestors. 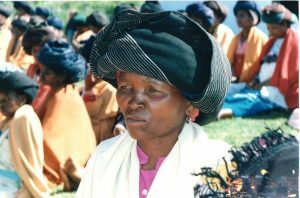 The tribal (non-westernized) Xhosa are largely unreached. As of the writing of this summary, there are no known Christian missionaries in the southern Transkei other than ourselves. The largest cult in our area is the Zion CC. They believe in the Bible but also still believe in and practice ancestral worship. Not all the amaXhosa maintain a tribal lifestyle. Many of the Xhosa people have prominent positions in government and commerce. It is noteworthy to mention that out of the Xhosa tribe came Nelson Mandela, Desmond Tutu, and the ANC party which currently dominates the government of South Africa.